Dear Readers, I hope you’re staying cool during this particularly hot, muggy stretch of summer! 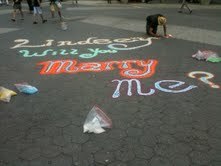 I wanted to share this photo with you, of a New Yorker in Union Square this morning creating a marriage proposal with beautiful, brightly colored bags of sand. It occurred to me that on a windy, or even breezy day, this wouldn’t be possible–the sand would completely blow away. Lindsey, wherever you are, we hope you say YES. This is may be the only good reason for this hot and humid summer weather! As I have no sweat glands, it becomes very difficult during these humid/hot months to get by with simply panting. The even bigger down side to this is every girl at the park thinks I have a thing for her consequently when they see me panting and drooling. I’ve been looking into a kiddie pool to cool off in, but it’s not exactly travel size. Any advice?